Just about the time I start to think, “I might as well put that poor carnival out of its misery”… I’ll have a day like yesterday. Because that is the universe’s way of letting me know that I am going to keep getting handed these kinds of crazy tales… every stinkin’ week. And because y’all know I’m all about making you feel perfectly normal, I’ll sacrifice for the masses and commit it to a blog post. Please say you’ll join along! 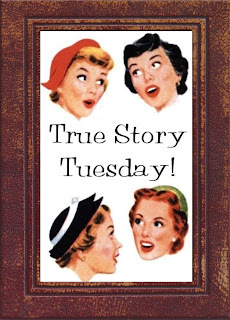 Just grab the True Story Tuesday button on the right sidebar (copy and paste the gobblydegook underneath it into your post), and link up your hilarious, amazing, outrageous, miraculous and true tale! Mother’s Day this year was beautiful. Mr. Daddy’s mom was finally able to attend church for the first time since her surgery. It made my heart happy to see her wheelchair surrounded by people who love her… little children climbing into her lap. So I was basking in that sweet joy of simply getting another Mother’s Day with those I love. Realizing anew how rare and wonderful it is to have a World’s Best Mom, as well as a World’s Best Mom-In-Law. Then the preacher man stood up with an announcement. Ladies and gentlemen: the bathroom at the back of the church is plugged. If you need to use the bathroom, please go into the office one. There was a general chuckle as the next song began. During the same song, the preacher man was tapped on the shoulder and he swiftly departed. Ladies and gentlemen: the office bathroom is plugged. If you need to use the bathroom, please go home. More laughter. Especially as I realized that the last person who exited the office bathroom door was a 3-year old girl. Eek! But it didn’t end there. Of course not. Two minutes later, a Sunday School worker brought Itty Bit out to me. Momma, I hafta go PEE-PEE! The Sunday School worker giggled and said we could use the office. But it’s plugged now too! Don’t worry, he can just pee. She led us into the office where two nice ladies sat counting the offering. It’s just PEE. He can go in there, right? But I had no clue what awaited me. I realized that Itty Bit had helpfully taken off his shoes in Sunday School. Which meant that I had to hold a very lanky 4-year old with his feet off the wet floor (PEE PEE WATER! 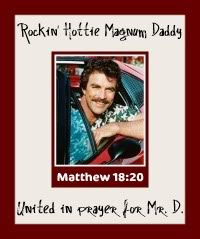 ), lean back to try to get him to unbend at the waist, unsnap/unzip/shimmy his pants low enough to give him clearance, then tell the poor kid to pee while the Offering Counting Ladies giggled. Heaven help me, in order to keep my failing grasp on his skinny little body without getting showered, I’d leaned him back too far. You’d think my taking a barefoot kid pee in a plugged up church office bathroom at a packed Mother’s Day service trauma would be enough, no? With Itty Bit’s excitement at having decorated the wall, I very nearly overcompensated as I attempted to hold the wriggling kiddo horizontal and let him pee straight down into the toilet. The Offering Counting Ladies were snickering a rather unrighteous amount (there may have even been a sacrilegious guffaw or two). Finally, the fount was exhausted. And then I realized that I couldn’t possibly hike those pants back up while holding him one-handed. (Don’t forget – I was standing in PEE PEE water the entire time). So step back into the main office space, shielding my kiddo’s mini-manhood by walking backwards. Itty Bit is slipping out of my grasp (have you SEEN how short I am?) and I finally give up and set him down. Oh the abject terror and instant wailing. Friends, I had not realized that the CARPET in the office was also soaked with PEE PEE WATER. I can only imagine what the congregation thought of the sudden ruckus in the office. MOMMMMMY!!!! AAAAAAAAAAAAAHHHH! WET WET WET WET!!! With that, he proceeded to monkey climb his way up my leg until he was safely ensconced on my hip. He then smiled at me cheerfully. And that, my friends… is how I ended up with PEE PEE WATER all over my pants as I dragged a barefoot kid out of the church office and back into the sanctuary. Any family legends that are just begging to be shared? It’s easy to link up! Just add your post below and we’ll be around for some comment love! Oh, my, word, Rachel that is so funny!! I am sitting here in the airport trying to not laugh out loud! Talk about motherly duties! That's too too funny! How in the world did you ever do all this with a straight face? I'm sure the only reason the offering ladies weren't rolling on the floor was because the carpet was wet. Love me some Itty Bit! I can't believe you went back to the sanctuary. You are brave. I would have trotted straight back to the car and home for a bath. I'm laughing too hard to even come up with a good comment right now! Ha! I thought those things only happened to me! You are going to have the best memories!! lol - I would have walked to my car, opened the car door for a shield and let him pee in the parking lot...Cam did that many times in Wal-Mart Parking lot. I was afraid he wouldn't make it and he didn't care who saw his mini-manhood! Cute story..next time let Mr. Daddy take him, then he can be the one wearing pee pee water pants! Ya know, this one wasn't that many Tuesdays ago. Funny! And he will be SO mad when he learns how to read! So were the offering ladies rolling on the floor laughing by the time you made your exit? I guess not considering the pee pee water! Don't you dare EVEN dream of giving up TST! And I am so delighted that MIL felt up to attending the Mother's Day Service! What a blessing! Kids Itty Bitty's age aren't the best at olding it. I know my kid couldn't have held it. I am secretly glad our church has quite a few bathrooms! Oh.my.word. Only you Rachel- SERIOUSLY. Reason #49230 I think you are on The Truman Show. Yes, I'll keep typing the same exact comment until something else comes to mind. But I don't think that's happening anytime soon. Oh and I'm with Stacy- so happy your MIL got to get out of the house and go to church. What a blessing. You should make a list of the skills you didn't realize mothering would involve!! Oh my gosh, that is insanely crazy and funny at the same time!! It IS a good thing he is so cute! So glad you got to celebrate Mother's Day with those you love! Yikes! ...and that is why, to this day, when my boy is already 6, I still keep an empty plastic bottle in the car. I kid you not. You'll never know when you might need it! HAHAHAHAHA!! I have done the hold and pray move but never standing in pee pee water lol. That is too funny. Your kidding right? I swear it had to only be you to get into that position. I have no idea what I would have done but I love hearing what you did.I wish you knew how much you make me laugh and just simply brighten my day! Nothing like motherhood to make you do things you never dreamed of doing. The things we do for love. Please keep TST, even if no one else participates, your stories make me glad it's Tuesday. Lol! No I don't think you could make that up. Sounds like the church needs a much better plumbing system. And that Moms Skills Test? Yeah, there's be a LOT less moms if parenting was based on a pass/fail on a test like THAT! Nice job, Mom! You're certainly earning your degree! I Heart Faces–May People’s Choice! Have I Ever Introduced You?